Epilepsy Medication Reminders You Won’t Forget. And everyone seems to like it! The e-pill Multi-Alarm PLUS has been featured by Katie Couric, Dr. OZ and is member tested and recommended by the National Health & Wellness Club. And there are other versions of the e-pill Multi-Alarm PLUS: The pill-box is available in children’s versions as well as smaller versions: the e-pill 37 Alarm Multi-Alarm POCKET XL and the 37 Alarm Multi-Alarm HOME that fits on a home refrigerator. It’s kind of hard to beat success. 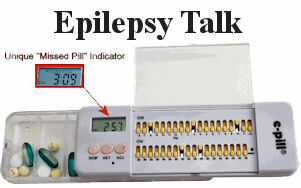 So, if you want to purchase the e-pill Multi-Alarm PLUS, simply go to e-pill Medication Reminders at http://www.epill.com or call (800) 549-0095. (By the way, I researched pill reminders seven ways to Sunday and all websites pointed to one solution: the e-pill Multi-Alarm PLUS. So I guess they must be doing something right. Written by Phylis Feiner Johnson. I've been a professional copywriter for over 35 years. I've also had epilepsy for decades. My mission is advocacy; to increase education, awareness and funding for epilepsy research.